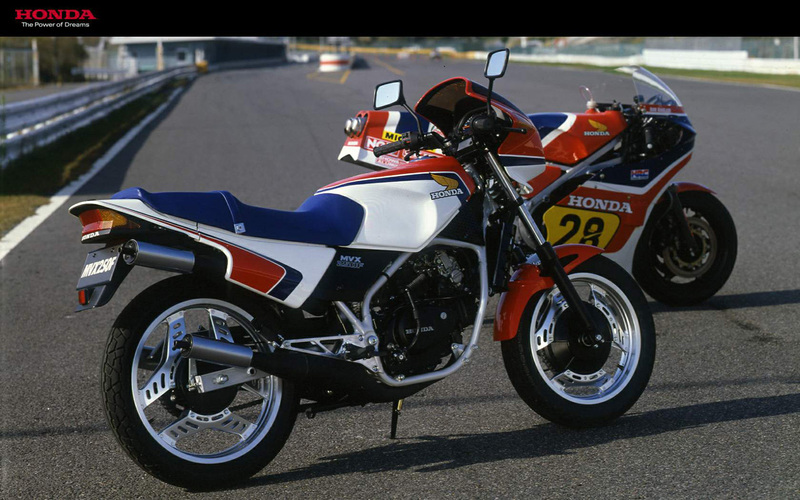 This MVX250F Honda in 1983, played the first road race in the World Grand Prix, to blink three times champion recorded a two-cycle 90-degree water-cooled V-type three-cylinder engine race car, "Honda NS500" the latest high to devote to technology development. High output and lightweight, slim, has been developed to target the compact MVX250F engine, two-cylinder horizontally forward crankcase, behind the 90-degree angle with a unique cylinder with Honda's unique 90-degree cylinder V-3 layout. As a result, 40-horsepower high-output and 3 with a two-cylinder engine and a slim, compact cylinder-like. In addition, a rear and front part of the Connecting Rod reciprocating mass inertia of the weight is balanced by two-cylinder and cylinder, vibration theory following a "zero" to achieve. 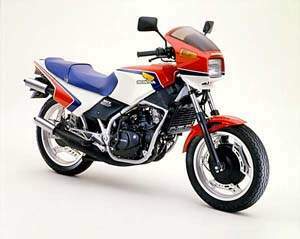 ２サイクルエンジン特有の振動を低減している。 Two specific to reduce the vibration of the engine cycle. The new design of high-performance engine with carburetor. Flat valve carburetor square-colored kite for the first domestic car is lighter and reduces inhalation resistance, and the compact, as well as streamline the entire engine, has contributed greatly to the compact. Vehicle design, development and pursuit of ease of取RI廻SHI by superior maneuverability and light weight. 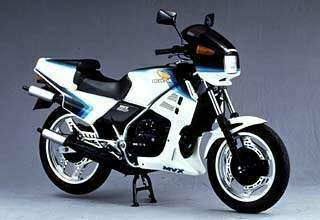 Lightweight, DABURUKUREDORU type of frame rigidity and high front came from a wealth of racing experience and 16 and the adoption of pro-link rear suspension and Honda's own NCHIHOIRU Lee, lightweight design and superior maneuverability ( 138Kg: dry weight) is possible.